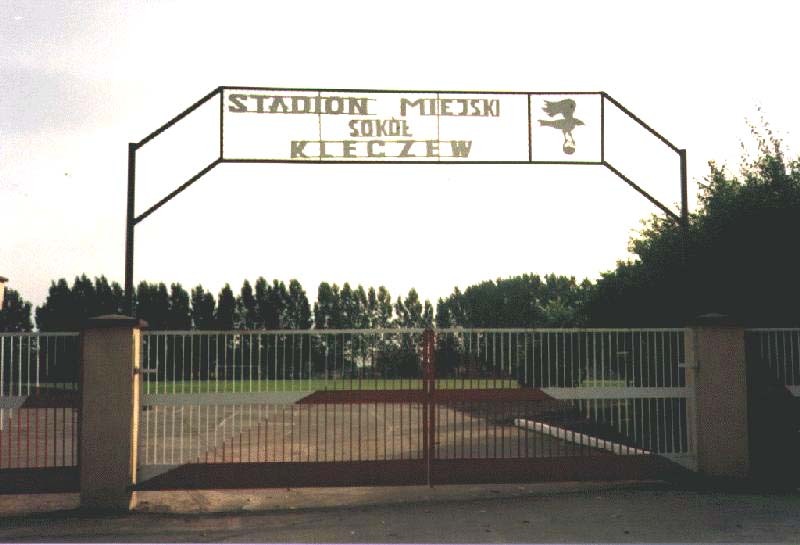 To the memory of the Krzywanowski family from Kleczew and Poznań. Kleczew was granted the status of a township in 1366. Until the middle of the 19th century it was an urban settlement of private ownership. The beginning of the settlement in Kleczew is in the second half of the 18th century. Among the Jewish artisans registered in 1764 – 2 were waggoners. Owners of the place gave privilege for free Jewish settlement in Kleczew, but during the years 1823-1862 The Russian Authorities prohibited Jews from settling there because of its closeness to the border. However, the Jews knew how to overcome these restrictions and the Jewish population grew. The Jewish merchants served as mediators in the grain crops trade between estate owners and villagers of the surrounding areas and urban centers, mainly Łódź. The Jews also were involved in export of grain crops, wool and agricultural products to foreign countries, mainly Prussia. Small traders and peddlers wandered in the villages of the region and made a living from selling craft works and buying agricultural products. Their economical activity centered on market days and fairs. The institutions of the community founded close to the foundation of the Jewish settlement. 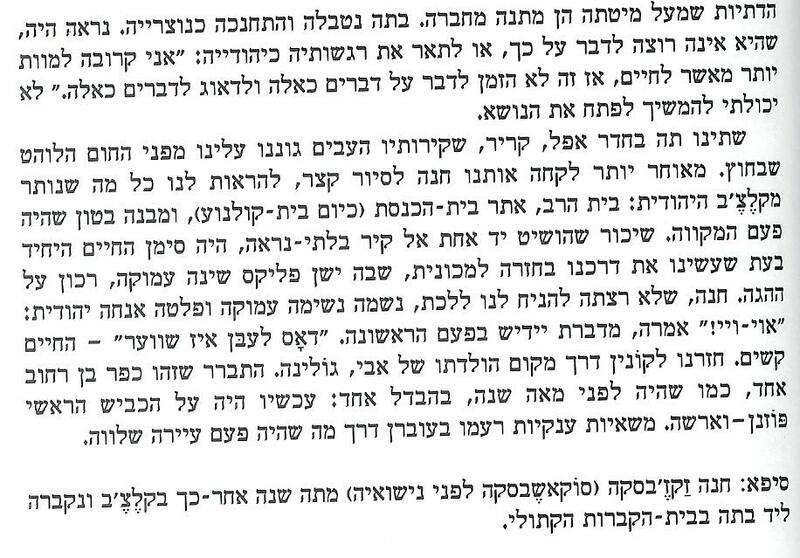 Known are the following Rabbis in Kleczew: R' Nachman Amsterdam (1819), R' Yehoshua Falk and after him served as Rabbis: R' Abraham Tzvi son of R' Elazar Perlmuter (1879), R' Shlomo Auerbach (approximately 1892), R' Tzvi Kaufman (1924), R' Tzvi Hirsh Zabludower (1927). Before World War I there were 2 synagogues in Kleczew and one Beth Midrash and they continued to exist also after 1918. In the period between the two World Wars branches of the political movement Zionim Klaliim (General Zionists, "Al Hamishmar"), Hamizrachi and organizations of the League for Working Eretz Israel. Towards the Zionist Congresses around 60 Shekels were collected in Kleczew. Most of the votes were given to Hamizrachi (in 1937 – 48 votes). Among the public institutions which existed in Kleczew were: The Artisans Association, Bank, charity fund, Linat Tzedek Society. Also a library was active and beside it, evening lessons of Hebrew were given. Kleczew was occupied by the Germans on September 15th, 1939. Within a short time the Jews were ordered to wear marks of disgrace (bands in white and blue over their arms) and massive confiscation of the Jewish property started. The Jews were also commanded to collect contribution (kontrybucja) of 20,000 zloty, and in order to secure the collection of it and within the time limit set, hostages were prisoners from among the distinguished personalities of the community. Until the end of 1939, two more contributions were forced on the Jewish community. Many Jews were taken out of their homes and instead of them police and army men and also Germans who arrived there from the territories annexed to the Soviet Union. A Judenrat was erected and Hersz Pelc was its chairman. 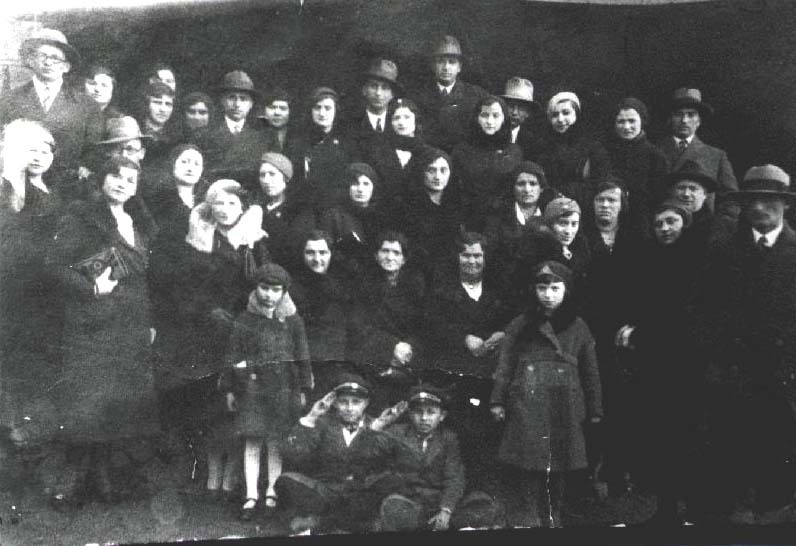 Among the members of the Judenrat were also Jewish refugees who were not from Kleczew. The Jews were occupied in the forced labor, building bridges, paving roads and other works in the town itself. On 17-18 August 1940 the general deportation of the Jews of Kleczew took place. The Jews were expelled to Bełchatów, Bełchatów, Grodziec and Rzgów. After a few months groups of men among the deportees of Kleczew were transported to the forced labor camp in Inowrocław. The others were murdered in the forests near Kazimierz Biskupi. 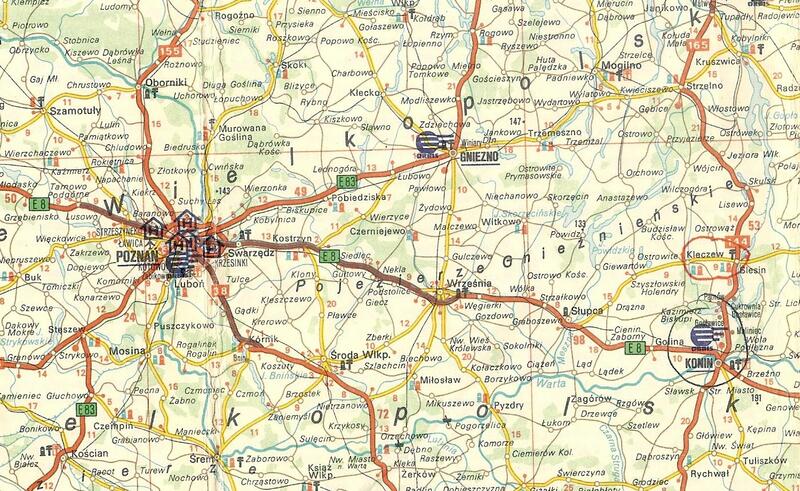 1) As per Adrian, via email 3.2.2011 - the district was Kalisz before WWII (nowadays: Konin). לקלצ'ב Kleczew הוענק מעמד של עיר ב-1366. עד למחצית הראשונה של המאה ה-19 יישוב עירוני בבעלות פרטית. תחילתו של הישוב היהודי במחצית השנייה של המאה ה-18. בין בעלי מלאכה יהודים רשומים ב-1764 - 2 עגלונ⳩ם. בעלי המקום נתנו זכות להתיישבות חופשית יהודית בקלצ'ב, אולם בשנים 1862-1823 אסרו השלטונות הרוסיים על יהודים נוספים להתיישב בעיירה בשל קרבתה אל הגבול. עם זאת ידעו היהודים לעקוף את ההגבלות הללו והישוב היהודי גדל. הסוחרים היהודיים שימשו מתווכים בעסקי תבואה בין בעלי האחוזות והאיכרים בסביבה לבין מרכזים עירונים וביחוד עם לודז'. כן השתלבו ביצוא תבואה, צמר ומוצרים חקלאיים לארצות חוץ ובעיקר לפרוסיה. סוחרים זעירים ורוכלים נדדו בכפרים באזור והתפרנסו ממכירת מוצרי מלאכה ומקניית מוצרים חקלאיים. פעילותם הכלכלית התרכזה בימי השוק והיריד. מוסדות הקהילה הוקמו סמוך להתהוותו של הישוב, היהודי. ידוע על כהונתם של הרבנים הבאים בקלצ'ב: ר' נחמן אמשטרדם (1819), ר' יהושע פאלק ואחריו ישבו על כס הרבנות: - ר' אברהם צבי בר' אלעזר פרלמוטר (1879), ר' שלמה אויערבך (1892 בקירוב), ר' שלמה צבי קויפמאן (1924), ר' צבי הירש זאבלודאווער (1927). לפני מלחמת העולם ה-1 היו במקום 2 בתי כנסת ובית מדרש והם המשיכו להתקיים גם אחרי 1918. בתקופה שבין שתי המלחמות, פעלו בקלצ'ב סניפים של ציונים כלליים (על המשמר), המזרחי וארגונים של הליגה למען ארץ ישראל העובדת. בממוצע לקראת הקונגרסים הציוניים נמכרו בקלצ'ב ב-60 שקלים. רוב הקולות ניתנו להמזרחי (ב-1937 – 58 קולות). מבין מוסדות ציבור שנתקיימו בקלצ'ב ראויים לציון: אגוד בעלי מלאכה, בנק, קופת גמילות חסדים, חברת לינת הצדק. כן פעלה ספריה ולידה אורגנו שעורי ערב לעברית. קלצ'ב נכבשה ע"י הגרמנים ב-15 בספטמבר 1939. תוך זמן קצר נצטוו היהודים לענוד אות הקלון (סרט כחול לבן על זרועם) והוחל בהחרמת הרכוש. כן נדרשו לאסוף קונטריבוציה בסך 20,000 זלוטי, וכדי להבטיח את מסירת הכסף במלואו ובמועד שנקבע, נלקחו בני ערובה ה מבין נכבדי הקהילה. עד סוף 1939 הוטלו על הקהילה שתי קונטריבוציות נוספות. יהודים רבים הורחקו מדירותיהם ושוכנו בהן אנשי צבא והמשטרה ואף הגרמנים שהגיעו לכאן מהשטחים שבשליטת הסובייטים. במקום הוקם היודנראט ובראשו עמד הרש פאלץ. בין חברי היודנרט היו גם פליטים שלא מבני קלצ'ב. במסגרת עבודת כפייה הועסקו היהודים בבניית גשרים, בסלילת כבישים ובעבודות שונות בעיירה עצמה. ב-17-18.8.1940 בא גירוש כללי של יהודי קלצ'ב. 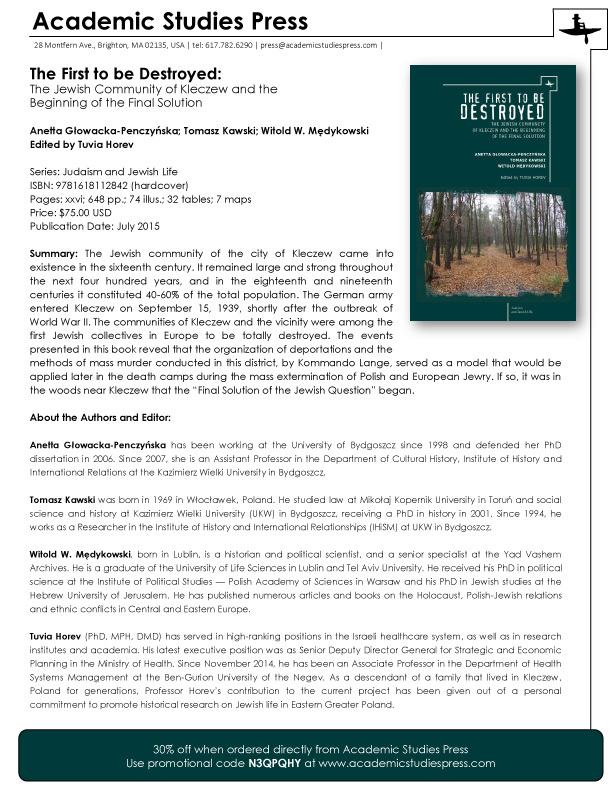 הם הובלו לבלחאטוב Bełchatów, לזאגורוב Zagórów, לגרודז'ייץ Grodziec ולז'גוב Rzgów. אחרי מספר חודשים נשלחו קבוצות גברים ממגורשי קלצ'ב מזאגורוב, למחנה העבודה באינוברוצלאב Inowrocław . האחרים נרצחו ביערות הסמוכים לקאז'ימייז' ביסקופי Kazimierz Biskupi. איו"ש (ארכיון יד-ושם בירושלים): M-1/E 1872/1719, M-1/E 2104/1888' M-1/Q 1099/16, M-1/Q 2002/471, M-1/Q 2105/491. "הצפירה": 28.10.1877, 16.10.1879, 18.1.1892, 8.10.1892. A widow named Hannah was the sole Jewish inhabitant left in the little town of Kleczew, near Konin. Maybe the place was less torpid when the Jews lived here in considerable numbers. Mike Jacobs of Dallas had found Hannah on his last visit to the area and given me her address. We waited a long time before she appeared at the door, barefooted, a short, rotund woman with dark eyes and olive skin. She patted her dyed black hair into place while Izzy told her who we were. Hannah led us into her room, sombre with dark furniture and a brown tiled stove. Seeing her unmade bed, I realized we had disturbed her afternoon nap. Above the bed were two religious pictures, one of Jesus bathed in a heavenly beam of light, the other of the Holy Virgin. Hannah put on her shoes and glasses and smoothed her dress. I gave her a colour snapshot that Mike Jacobs's wife, Ginger, had asked me to give her. It was a photograph she had taken of Hannah standing next to her daughter's grave in Kleczew. Hannah looked at it silently for a while, then gave each of us an emotional kiss. Hannah was born into a Yiddish-speaking family in Kleczew in 1910. She had forgotten all her Yiddish, she said, and could speak only Polish. In December 1939 she married a local gentile, and soon after that a helpful German gave her false papers. She hid for a time in a cellar in Kleczew. One day, through a keyhole, she saw the Germans rounding up the Jews for deportation. Later, one of her husband's relatives informed on her, but she managed to avoid arrest and left Kleczew. She and her husband returned after the war. Parcels from her relatives in America helped them get by. The dress she was wearing today was made from material sent by an uncle in New York. She could have joined him in America but for one thing that prevented her ever leaving Kleczew: 'How could I leave my daughter's grave behind?' She showed us a portrait of the young woman who had been her only child. From the clues offered, I guessed that she had died of cancer. Five weeks after her death, Hannah's husband hanged himself. Since then she had lived here on her own, coping with heart trouble but managing to look after herself. She was in touch with Teresa in Konin, whose mother, Nadzia, had been a friend. 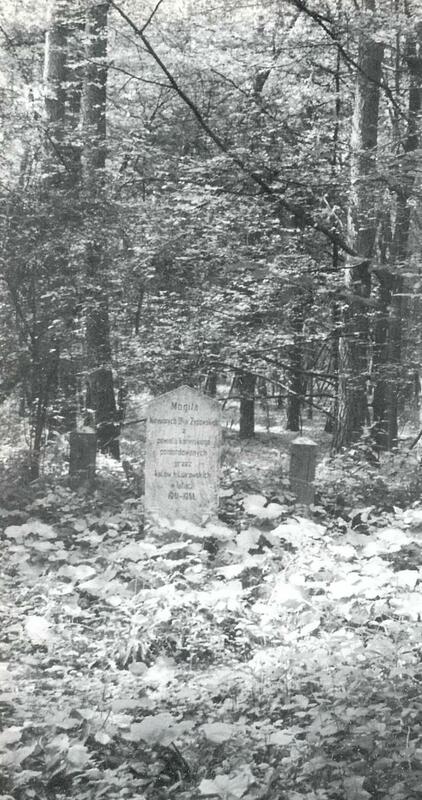 In 1948, with the help of two non-Jews, one of them a stonemason, Hannah erected a few simple tombstones in the nearby forest at Kazimierz in memory of the Jews buried there in mass graves. It took more than thirty years before the local authorities got round to erecting an official memorial. A memorial to the massacred in the Kazimierz forest (Theo Richmond, Konin a Quest, Vintage1996, photo nr. 42). In 1954 she experienced 'a period of hatred' when a group of local youngsters in their early twenties repeatedly scrawled 'Dirty Jew' on her windows. They were caught and given heavy jail sentences, and since then she had been left in peace. The religious pictures above her bed were a present from a friend. Her daughter had been baptized and brought up in the Catholic faith. She seemed unwilling to discuss this or to describe her own feelings about being Jewish: 'I am nearer death than life, so this is not the time for talking about such things and worrying about such things.' I could pursue the subject no further. Later, Hannah took us on a brief tour to show us all that was left of Jewish Kleczew: the Rabbi's house, the site of the synagogue (now a cinema), and a cement shack that was once the mikve. A drunk reaching out with one hand for a non-existent wall was the only sign of human life as we made our way back to the car, where Feliks was fast asleep, hunched over the wheel. Hannah, reluctant to let us go, took a deep breath and released a drawn-out Jewish sigh: 'Oy vey!' she said, speaking Yiddish for the first time. 'Dos lebn iz shver' - Life is hard. We returned to Konin via my father's birthplace, Golina. It turned out to be a one-street village, as it had been a hundred years ago, with this difference: now it happened to be on the main Poznan-Warsaw highway. Juggernauts thundered through the once peaceful shtetl. Postscript Hannah ZAKRZEWSKA (née SOKASZEWSKA) died a year later in Kleczew and was buried near her daughter in the Catholic cemetery. The Krzywanowski family of Lotka (Lea) z"l from Kleczew and Poznań, (Kalisz region), Poland, in a family wedding, taken around 1936. 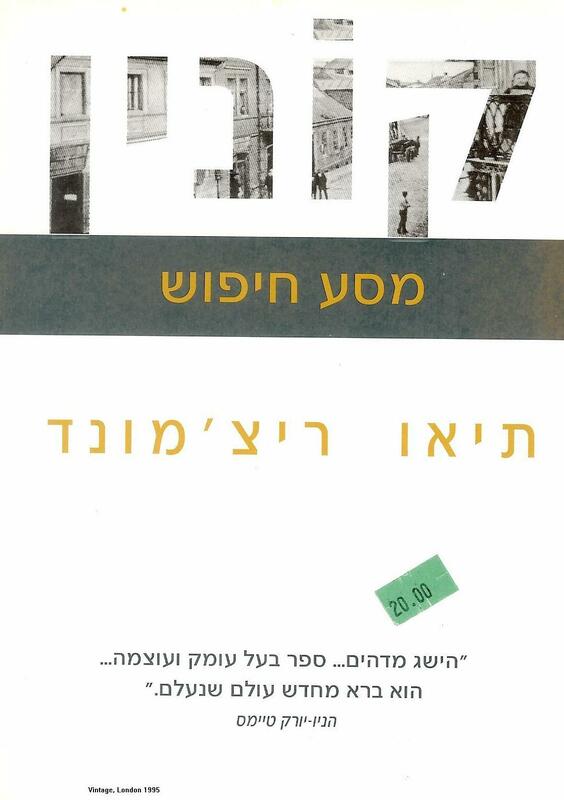 תמונת חתונה – קלצ'ב 1936. יושבת רביעית מימין חנה Hana האם לבית הרשליק Herszlik מקונין Konin (עיר מחוז ליד קאליש), ילידת 1888. לוטקה (לאה) ( Lotka (Lea עומדת שנייה משמאל. חסר בתמונה האב משה קשיבאנובסקי Mosze Krzywanowski היות וסרב להצטלם בשל אדיקותו ("לא תעשה לך תמונה"). מוצאו מהעיירה השכנה דומביה Dąbia. יושבים שני האחים הקטנים יעקב Jakob בן ה-6 ומכל (מיכאל) Machel בן ה-8, עומדות פרניה Franja בת 14 ורוזה (רושקה) ( Roza (Ruzka בת 12. ישנה בתמונה טובה ואטמן Towa née Watman לבית קשיבנובסקי, אחותה של לוטקה ובעלה שמואל Szmuel השען מהעיירה וילצין Wylczyn. נספו עם בנם הקטן סאלק Salek. 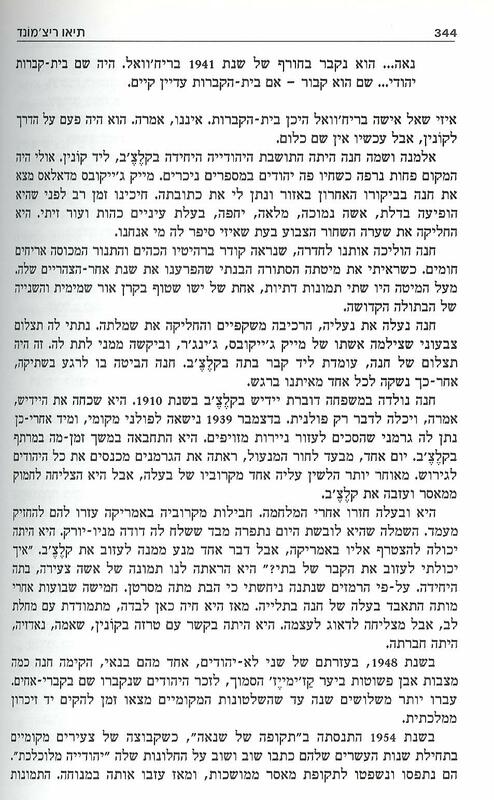 בתמונה גם האחות ברטה Berta התופרת, כבת 30 בהירצחה. יחד עמם גם האח הרש Hersz בן ה-20, ישראל Israel בן ה-32, מניה Manja בת ה-28, חיים-שלמהChaim Szlomo בן ה-36 ואשתו שרה Sara לבית גוטלובוביץ Gutlowowicz. לוטקה (לאה) קשיבנובסקי, נולדה בקלצ'ב, בחודש נובמבר 1913, למשפחה בת 12 ילדים. מתוך משפחה זו רק לוטקה שרדה, מהסיבה הגורלית שהיא עזבה את קלצ'ב ממש בסמוך לפרוץ מלחמת העולם השנייה, בשלהי יולי שנת 1939, במסגרת עלייה ב' באוניה "קולרדו", והגיעה להכשרת "לשחרור" ברחובות. בשנת 1941, עלה גרעין זה וקבוצות אחרות, על הקרקע ובנו את קיבוץ רמת השופט. ברחובות, הכירה לוטקה את ישראל הס, שעלה לארץ מאושבינצ'ם בשנת 1935. נולדו להם שני ילדים. עדנה ואדם. אדם נפטר ממחלה בגיל 17 בשנת 1963, דבר שקיצר את חייו של ישראל, שנפטר בשנת 1970. לוטקה נישאה בשנית למאיר הולצמן בשנת 1972, כשהתברר שבעצם הם עלו לארץ מפולין ביחד באותה אוניה: "קולרדו". לוטקה ומאיר חיו ביחד בקיבוץ רמת השופט 28 שנים. משפחת קשיבנובסקי, הייתה משפחה דתית אדוקה, אם כי לא אורתודוקסית ולבטח לא חסידית. אפשר להסביר זאת לפי ריחוקה של קלצ'ב ממרכזי החסידות של מזרח פולין ואוקראינה. קלצ'ב כידוע, נמצאת במחוז קונין. רחוקה כמאה ק"מ מפוזנאן. וזה מה שמסביר את העובדה מדוע בחודשי הסתיו של 1941, יהודי קלצ'ב, כמו גם יהודי עיירות נוספות בסמוך לקלצ'ב, הושמדו ביער הסמוך לקלצ'ב. בימי חייה, ניסינו להשפיע עליה ליזום נסיעת ביקור בעיירת הולדתה. והדבר לא צלח בידינו. לוטקה שייכת לאותם יהודים מפולין, שסרבו באופן נחוש לא לבקר באותם מקומות בפולין שנושא השואה היה עבורם טראומה אישית. מסיפוריה על תקופת ילדותה ובחרותה, נודע לנו על בית יהודי אופייני ליהדות פולין בראשית המאה העשרים. בית שנע בין רצון עז של אבי המשפחה לשמר את המסורת והדת היהודית, לבין השפעות אידיאולוגיות כמו הציונות והקומוניזם. לוטקה התחנכה במסגרת תנועת "השומר הצעיר" ולפי דבריה, הדבר גרם לקרע במיוחד בינה לבין אביה שגרם לה לעלות בניגוד לברכתו. לימים, התברר לה שהיא בעצם נותרה לבדה בעולם ממשפחה זו. בזמנו ביקרה עדה הולצמן (אחותי החורגת) בקלצ'ב והביאה מזכרת חיה בצורת צילום הבית שאותו עזבה לוטקה בשנת 1939. לוטקה עבדה כל חייה בקיבוץ רמת השופט באפייה ובמטבח. בהיותנו קרובים מאוד למעשה ידיה בכל הקשור לאפיית לחמים ועוגות, למעשה התוודענו להוויתו של בית אביה, אמה, אחיה ואחיותיה. כאן המקום להזכיר, שלמשפחת קשיבנובסקי הייתה מאפייה גדולה ששירתה את העיירה כולה. ביתם היה בנוי בצורת רכבת של מספר דירות ששימשו למאפייה, לחנות ולמגורים. בסמוך הייתה חצר גדולה ששימשה כאסם כמו גם מקום איחסון הקמח. מכיוון שבימי חייה, לא הצלחנו לשכנעה לקיים את ביקור ה"שורשים" בעיר הולדתה. גמלה בלבנו ההחלטה לנסוע ולקיים בשמה את הביקור המיוחל. הגענו לקלצ'ב, ביום קיצי-סגרירי והתחלנו לצעוד ברחוב המרכזי של העיירה שנקרא: "קונינסקיה". תוך שאנו מנסים לאתר את הבית המבוקש, לפי תיאוריה של עדה הולצמן וגם לפי תמונה שהייתה בידינו מביקורה מספר שנים קודם לכן. העובדה שאנחנו לא מצויים כלל בשפה הפולנית, הערימה קשיי תקשורת עם הסובבים, שגרמו לנו למבוכה רבה. למעשה עמדהו לעזוב את העיירה מבלי שאיתרנו ממש את הבית המבוקש. בסמוך לבית הכנסת, שהפך במרוצת השנים לבית-עם של העיירה, ובעיקר הקרינו שם סרטים, שהיה מטרים ספורים מהבית שחיפשנו, יצאו שלוש נשים מבוגרות שלדעתנו יכלו לשפוך אור על מבוקשנו. נגשנו ושאלנו אותן, תוך איזכור השם: קשיבנובסקי KRZIWANOWSKI. אחת הנשים פצחה בהתרגשות, בשטף של פרטים, ומילים תוך שהיא מצביעה על הבית ומאשרת לנו שזהו בית קשיבנובסקי. הדבר נתן אומץ בלבנו, הגענו לבית זה ועדנה החליטה לדפוק בדלת הכניסה ולהזדהות. פתחה את הדלת אישה מבוגרת, שלכל הדעות היה לה קשר כל-שהוא לדיירים שהיו קודם לכן בבית זה. מכיוון שאי-אפשר היה לתקשר, הקשר היה בפנטומימה תוך שהיא מהנהנת שהיא יודעת על מה מדובר. אבל כאשר ניסיתי לבקש לראות את הבית מתוכו, החמירו פנייה ושלחה מסר שבשום צורה ואופן לא תאפשר זאת. ניסיתי גם לצלם, אך היא סגרה בפני את הדלת בחוזקה. עמדנו לקבל את רוע הגזירה, התרחקנו צילמנו את הבית מרחוק ושמנו פעמנו לתחנת האוטובוס כדי לשוב חזרה לעיר קונין. לפתע, יצאה אשה מהחצר האחורית של הבית והחלה לנפנף בידיה, כמו קוראת לנו לשוב.... שוב פעם, השפה הייתה לנו לרועץ. אולם, ממספר המילים הפולניות הבנו, שהיא לא רק יודעת על ההיסטוריה של הבית ודייריו, כי אם היא רוצה לקחת אותנו למקום בו התרחשה ההיסטוריה. בעת השיחה, השמים הלכו והתקדרו וקיבלו צורה חורפית ובשרו על גשם שוטף שעומד לרדת. היא הוציאה את מכונית הפיאט מהחצר, והתחלנו לנסוע לכיוון היער, כאשר התחלנו להבין שהיא בעצם לוקחת אותנו אל המקום שבו הושמדו יהודי קלצ'ב והעיירות הסמוכות. מדיבוריה בפולנית הבנו בדיוק למה היא התכוונה, כשהביאה אותנו לכאן. אכן, מצאנו שם גלעד הכתוב בעברית, כמו גם אחרים באנגלית, פולנית וגרמנית, שבהם סופר על כך שהגרמנים בחודש דצמבר 1941 אספו את יהודי קלצ'ב ושאר יהודי העיירות והוציאו אותם להורג ביריות לתוך בורות סיד וחלקם גם במשאיות גאז. בכל מהלך השהות ביער, האישה ששמה מריה, גילתה התרגשות מרובה שהעידה על ההתייחסות שהיה לה קשר, בין מה שהיא ידעה על המקום, לבין העובדה שנצר ממשפחת קשיבנובסקי עומד ביער ורואה לנגד עיניו את הזוועה שהתרחשה לבני משפחתו מספר עשורים לפני כן. יש לציין, כי מריה הדגישה בפנינו את העובדה שאישה אחת מהעיירה, בגילה של לוטקה, הייתה נוהגת לומר שהיא בטוחה שאחד השרידים מבני המשפחה יבוא מתי שהוא לביקור בעיירה ובגיא ההריגה. היא הסתמכה על הזיכרון שלה שאחת הבנות לבית משפחת קשיבנובסקי נסעה לפלשתינה ערב פרוץ מלחמת העולם השניה. בתום הביקור המצמרר ביער, רצינו שהיא תקפיץ אותנו לתחנת אוטובוס, אך ירד גשם כבד וסוחף. וגם נוצר כבר קשר וחום בינינו והוא אילצה אותנו להגיע הביתה לשתות קפה אצלה. בהיותי מורה להיסטוריה של עם ישראל, נושא השואה מעסיק אותי רבות, וכשהיינו ביער, חשתי בהבדל בין קריאה במקור היסטורי כלשהו לבין מקום ההתרחשות. לא הייתי צריך להבין את מה שהיא אמרה בפולנית, כי היה לי ידוע שבסתיו 41, עדיין לא השמידו בתאי גאזים, כי אם בעיקר בבורות, כמו גם, ראיתי לנגד עיני את מה שכתב כריסטופר בראונינג, בספרו: "אנשים רגילים", על ההוצאות להורג של היהודים ברחבי אוקראינה.